Napa Valley is filled with wineries and the serious business of winemaking. But when the business day is done, the many people who work in the Valley all have to eat and to find places simply to hang out. Winery insiders patronize a number of choice local dining establishments in Napa, Yountville and St. Helena for lunch, or to have a few drinks after work. Winemakers and other industry types often gather in small, select groups, or just find each other at the bar to shoot the breeze, compare the price of grapes, discuss the latest trellising techniques, catch up on the latest gossip or simply eat and enjoy the company of others in this elite fraternity. There are many fine restaurants throughout Napa Valley, but a few seem to have become particular wine industry watering holes. Lunch is often the time that they gather for business meetings, casual get-togethers and off-peak chats, without the crowds. Or you can find some meeting during the cocktail hours before dinner. Locations include obvious choices, such as Tra Vigne, Martini House, Bistro Don Giovanni and the venerable Mustards Grill, one of the first restaurants in the area to cater to the local trade with Napa-insider puns on the menu and other arcana. But some are less well known to the general public, such as Cindy’s Backstreet Kitchen, started by the owner of Mustards Grill and located on Railroad Avenue in St. Helena, or the quirky Kelly’s No Bad Days Cafe, located in Napa at First and Main. Winemakers and winery owners all need to eat and . . . get noticed. “Mustards is only a mile and a half away,” said Dennis Groth, owner of Groth Vineyards. “The selection is great.” It is not uncommon to find Don Weaver from Harlan Estates, John Williams from Frog’s Leap or Robert and Margrit Mondavi strolling into Mustards Grill. And contrary to what one might think, the restaurant's bustling bar offers a huge selection of cocktails—even here, in the heart of wine country. 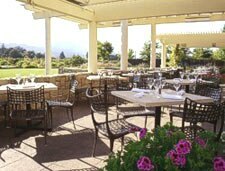 The Rutherford Grill in Rutherford is another popular meeting spot for winery folks. “You never know who will be sitting next to you at the bar, it could be a neighbor, or a fellow winemaker. I appreciate the good food and meeting others in the business,” said Groth. The no-reservations policy and outdoor dining area makes for a pleasant, egalitarian setting. Cindy’s Backstreet Kitchen attracts many locals due to its high-quality, low-key approach. Sitting a block behind the hustle and bustle of St. Helena’s Main Street, this homey little restaurant draws a crowd. Koerner Rombauer, of Rombauer and Frank Family Vineyards, plus the entire Shafer family, are all regulars at Cindy’s. A couple of Yountville spots that appeal to winery folks include Cucina à la Carte, located in the back on the Vintage 1870 Building, as well as the humble Pacific Blues Café. These places allow winemakers the ability to grab simple fare and down a few beers at affordable prices. Winemaker Kain Tazakoli, at Clos Du Val Wine Co., says his absolute favorite Napa spot is Bistro Don Giovanni. “You see all sorts of winemakers hanging out there,” Tazakoli says. He also enjoys going down valley into the city of Napa to visit the noble bar at Cole’s Chop House, or trade wine stories with fellow winemakers at the Bounty Hunter. “And don’t forget Taylor’s,” says Tazakoli, referring to the simple yet inimitable Taylor’s Automatic Refresher, a St. Helena staple that counts winemaker Joel Gott among its owners. Kelly’s No Bad Days Cafe is one of the oddest, yet most enjoyable spots around. The funky, humorous décor complements proto-Mexican/Californian cuisine. Winemakers and other locals like to visit No Bad Days, primarily for the fun atmosphere. Be forewarned, owner Kelly Novak hates Hummers, so if you own one, be sure to leave it at home. These are among the many Napa Valley spots that attract locals, who are looking for comfortable surroundings, some wine-country talk, fair prices, quality cuisine, good friends and an air of down-home sophistication. It is a virtual certainty that if you belly up to the zinc bar, in, say, Cindy’s Backstreet Kitchen, the grizzled guy in the torn flannel shirt sipping a gin and tonic will be the winemaker from a very well known winery up the road. Just ask him. The folks in Napa are friendly, and these Napa Valley hangouts are good places to find that out for yourself.